Alec Frank-Gemmill divides his time between concertos, recitals, chamber music and orchestral playing. He is widely recognised for pushing the boundaries of the French horn, whether by commissioning new music, making transcriptions of chamber music or through historically-informed performance practice. Alec was a member of the BBC New Generation Artists scheme 2014-16, appearing as soloist with the BBC orchestras on numerous occasions, including in performances of rarely-heard repertoire by Ethel Smyth, Malcolm Arnold and Charles Koechlin. He has been a regular soloist with the Scottish Chamber Orchestra, performing concertos by Mozart (on the natural horn) with Richard Egarr, Ligeti and Strauss with Robin Ticciati, and Schumann with John Eliot Gardiner. In 2017 Alec gave the premiere of James Macmillan’s Concertino for Horn, conducted by Andrew Manze. Often invited as a guest principal horn, Alec has frequently appeared with the Royal Concertgebouw Orchestra, London Symphony Orchestra and Chamber Orchestra of Europe. He also performs as part of period-instrument groups, most notably with Ensemble Marsyas. Their latest album “Edinburgh 1742: Barsanti & Handel” was critically acclaimed and singled out for its solo horn playing. 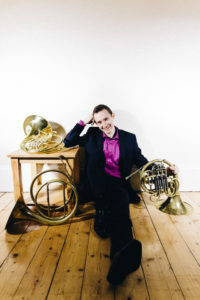 Alec is the recipient of a Borletti-Buitoni Fellowship, which enabled him to make two recordings for the BIS label: a disc of 19th Century works for horn and piano with Alasdair Beatson, and baroque concertos with the Swedish Chamber Orchestra conducted by Nicholas McGegan. Both albums have been highly praised in the press. Alec is Professor of Horn at the Guildhall School of Music and Drama in London, his alma mater. He also studied in Cambridge, Zürich and Berlin.